One of the most important aspects of a good betting strategy is to know how to manage your wagers. There are several ways to wager on thoroughbred horses. Lets break this down into two categories. Conservative and aggresive betting.The conservative horse player will apply a betting strategy but will limit his financial resource on all or part of the wager. For example: The conservative horse player will apply a betting strategy but will limit his financial resource on all or part of the wager. The conservative gambler will partwheel a trifecta, but not play the win bet because of money restraints. Or play the win, place, and show wager and not play a triple / exacta partwheel on a particular race. There are obviously many variations of limiting your wagers, and sometimes this is the cause for losing even after the betting system provides you the winning selection of the race....at long odds of course. The aggressive player will go after the bigger prizes and risk more money. The aggressive horse player will wheel, partwheel, key and double up on each wager type looking for a greater return. What's my point? With this book, each system tells you how to bet once you have deduced a winner after applying the particular system. It's A straightforward technique that is very simple and financially limited so you cannot risk too much and yet have a greater return......How? These systems give you longshots. A two dollar wager can provide nice returns on these betting systems. It's not often when these gambling systems formulate to a "favorite" top pick. Each system is geared to pick a longshot. I like huge returns. I like to win big at the track (who don't)! 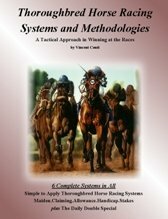 I needed to research and create winning systems and methods strictly for big profits which is exactly what I did and now I want to share these systems with each and every horse player. Thoroughbred horse racing has an assortment of wager types. As explained in my book, these wager types will increase your chances of winning. These winning systems provide their own betting strategy. All you have to do is apply the system correctly and be disciplined when at the betting window.